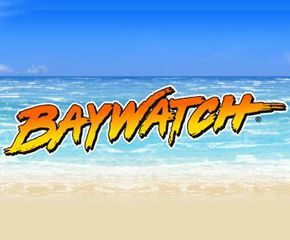 Based on famous Baywatch TV serial and movie, IGT has come up with a new slots game. The theme is fascinating with a beach background and some hot lifeguards. All the main characters of this blockbuster TV series (Cody, CJ, Caroline and Mitch) offers free spins features and two other bonus features. This slot has everything from beach views to glamorous lifeguards portrayed well within 5×3 reels. The bet ranges from 25p to £750 per coin. 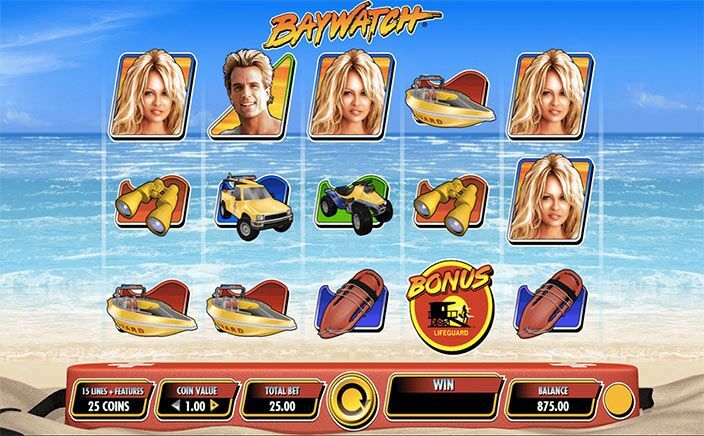 Baywatch slots is a 5 reel game with 3 rows and 30 fixed paylines. You will see lifeboats, binoculars, a rescue bike, a yellow racing boat and main characters of the show. The lifebelt is a scatter symbols and wild logo is a wild symbol, the wild symbol does not appear on reel 2. There is an another wild which is racing boat and triggers mainly on reel 3. Before you head to the beach party and dive in, you must set the coin range by ‘stake’ arrows and bet amount adjust many active paylines by ‘Lines’ button on the game screen. After all these things, you can tap ‘spin’ and start spinning the reels. you can also tap on ‘Autoplay’ to play a number of times. You have to keep your eye on 2, 3 and 4 reels, if Tide Wave bonus feature triggers, it can turn the whole row into the wild as well as adjacent reels can also turn into wilds and assure a big win. Another main feature is Team Work, if you win with a combined symbols combination it will give you a win of 25 coins per line. Free spins is the main and most attractive feature of Baywatch slots. When you get three or more bonus symbols land on the active paylines, you will get some free spins. You have to choose a male or female lifeguard and they will determine the number of free spins you will be granted. CJ: up to 6 free spins with CJ bonus symbols. Caroline: up to 12 free spins. Mitch: up to 6 free spins with Mitch bonus symbols. Cody: up to 12 free spins. With all the bonus and free spins feature, Baywatch slots is certainly a good launch. Maximum winning is 150X your stake amount which is little less than other slots, but progressive jackpots and a jackpot prize of 200 coins make it well-worth. The slot sports an excellent RTP of 96%, enough for a trial once.